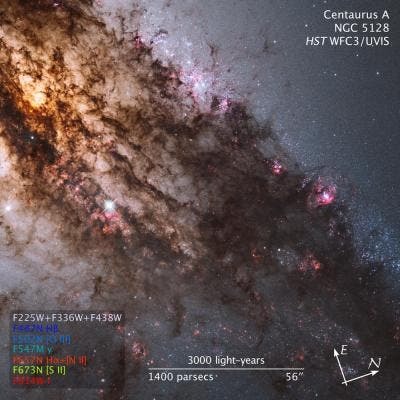 Hubble's panchromatic vision, stretching from ultraviolet through near-infrared wavelengths, reveals the vibrant glow of young, blue star clusters and a glimpse into regions normally obscured by the dark lanes of dust that crisscross the giant elliptical galaxy Centaurus A. At a distance of just over 11 million light-years, Centaurus A contains the closest active galactic nucleus to Earth –home for a supermassive black hole that ejects jets of high-speed gas into space (but neither the supermassive or the jets are visible in the image above. A dramatic new Chandra image below of Centaurus A provides one of the best views to date of the effects of an active supermassive black hole. Opposing jets of high-energy particles can be seen extending to the outer reaches of the galaxy, and numerous smaller black holes in binary star systems are also visible. The image was made from an ultra-deep look at the galaxy Centaurus A, equivalent to more than seven days of continuous observations. Centaurus A is the nearest galaxy to Earth that contains a supermassive black hole actively powering a jet. 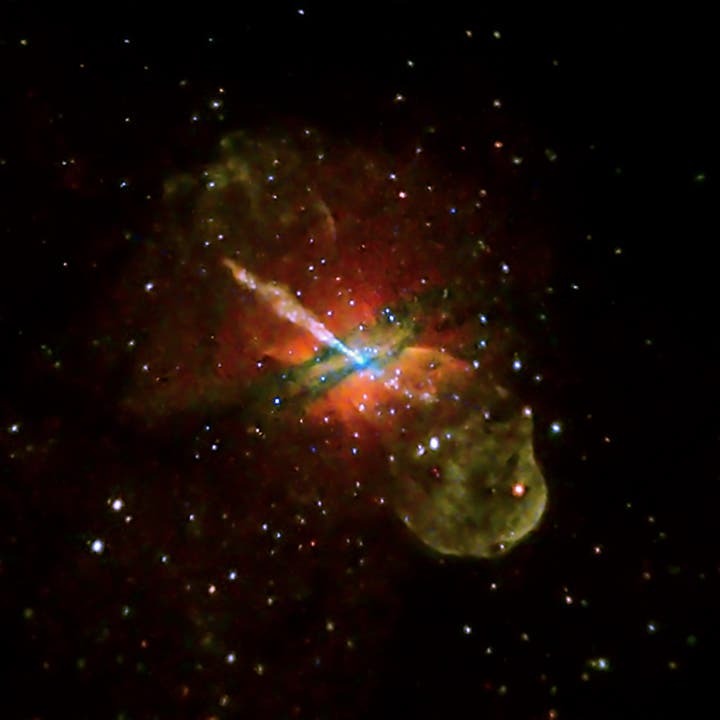 A prominent X-ray jet extending for 13,000 light years points to the upper left in the image, with a shorter "counterjet" aimed in the opposite direction. Astronomers think that such jets are important vehicles for transporting energy from the black hole to the much larger dimensions of a galaxy, and affecting the rate at which stars form there. High-energy electrons spiraling around magnetic field lines produce the X-ray emission from the jet and counterjet. This emission quickly saps the energy from the electrons, so they must be continually reaccelerated or the X-rays will fade out. Knot-like features in the jets detected in the Chandra image show where the acceleration of particles to high energies is currently occurring, and provides important clues to understanding the process that accelerates the electrons to near-light speeds. The inner part of the X-ray jet close to the black hole is dominated by these knots of X-ray emission, which probably come from shock waves — akin to sonic booms — caused by the jet. Farther from the black hole there is more diffuse X-ray emission in the jet. The cause of particle acceleration in this part of the jet is unknown. Hundreds of point-like sources are also seen in the Chandra image. Many of these are X-ray binaries that contain a stellar-mass black hole and a companion star in orbit around one another. Determining the population and properties of these black holes should help scientists better understand the evolution of massive stars and the formation of black holes. Another surprise was the detection of two particularly bright X-ray binaries. These sources may contain stellar mass black holes that are unusually massive, and this Chandra observation might have caught them gobbling up material at a high rate. In this image, low-energy X-rays are colored red, intermediate-energy X-rays are green, and the highest-energy X-rays detected by Chandra are blue. The dark green and blue bands running almost perpendicular to the jet are dust lanes that absorb X-rays. This dust lane was created when Centaurus A merged with another galaxy perhaps 100 million years ago.